The #31 in front of the McCloud shops on 31 August 1957. Photo is by Jerry Lamper and is used here with permission. The #31 is wearing the silver carbody with orange stripe that it was delivered in. A color photograph, also by Jerry Lamper, of the original paint scheme. The #31 wearing the later paint scheme. George Landrock collection. Another shot of the #31 from the George Landrock collection. The #31 at rest in the McCloud yard in June 1969, between the time it was retired following the arrival of the three SD38’s and the time it was sold to Chrome Crankshaft. Unknown photographer, courtesy of Jimmy Bryant. 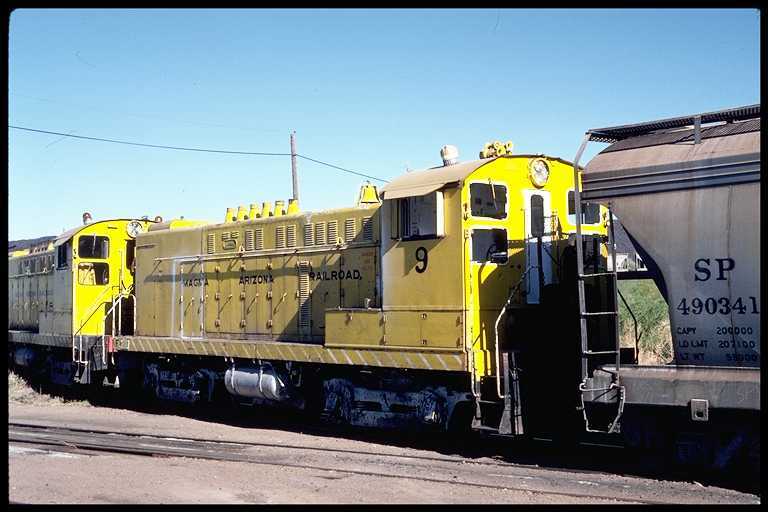 McCloud #31 seen here as Magma Arizona Railroad #9 at Superior, AZ in April 1981. 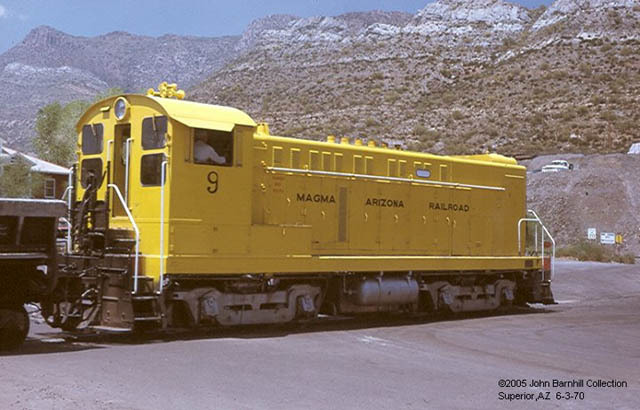 The #31 is working with Magma Arizona #8, which was built as Medford Corporation #8 for use on their logging railroad east from Medford, OR. Photo by Bart Barton and is from the collection of the Arizona Railway Museum. Another shot of Magma Arizona #9 in Superior, AZ. Note the differences along the top of the hood when comparing these photos to the unit on the McCloud River. Baldwin built this unit so that it could be converted from an S-8 to a S-12 through adding a turbocharger at a later date. This was never done, and sometime after arriving in Arizona the Magama Arizona modified the hood, replacing the single exhaust stack characteristic of turbocharged Baldwin diesels with six exhaust stacks, one for each cylinder, found on normal non-turbocharged diesels. Photo from the John Barnhill collection.